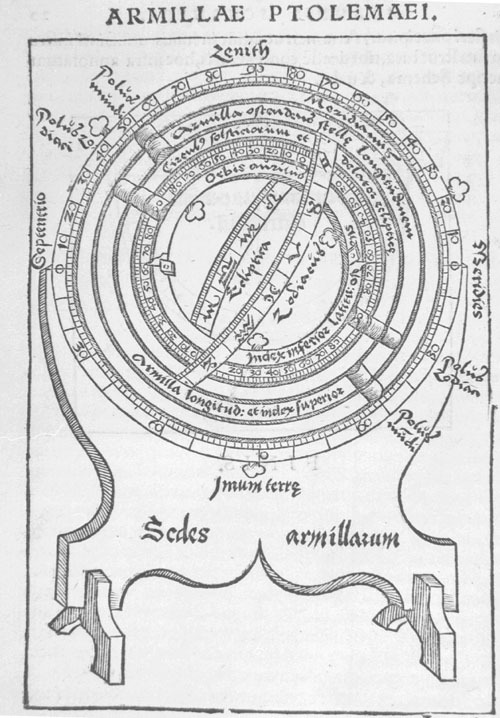 The armillary sphere image from Schöner's edition of Regiomontanus's description. 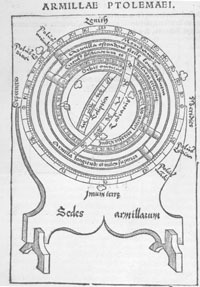 The armillary sphere, or spherical astrolabe, was the most complex of the instruments that Ptolemy described in the Syntaxis, comprising seven interlocking, graduated rings, representing the fundamental circles of the heavens, that swivelled around various axes within a skeletal sphere. It was designed to permit direct reading of the position of a celestial body in convenient co-ordinates. As demonstration instruments, used in teaching the concepts of astronomy, armillary spheres endured long after the Middle Ages and survived the overthrow of the Ptolemaic system itself. As practical instruments, at least as described by Ptolemy, their use was limited; for accurate results a very skilled observer was required to align all the rings correctly before making an observation.